Google Compute Engine combined with SaltStack systems and configuration management software automates cloud for speed, scale and reliability. SaltStack and Google Compute Engine are a perfect combination for building out modern infrastructures. We deliver rapid access to substantial compute resources, high-quality VMs, configuration flexibility, & event-driven compute that autoscales to demand. SaltStack, the full software stack for application configuration management, private cloud building, public cloud orchestration and autonomic infrastructure, today announced cloud provisioning and orchestration for Google Cloud Platform’s infrastructure service, Google Compute Engine, which was just released to general availability. Full details of the integration can be found in this SaltStack post on the Google Cloud Platform blog. Autonomic, event-driven compute resources that autoscale to demand. SaltStack is first used to provision Google Compute Engine resources and then to provide ongoing management and automation of Google Compute Engine VMs and configuration management of the application stacks running in Google Compute Engine. A tutorial on SaltStack integration with Google Compute Engine can be found here. SaltStack helps Web-scale IT organizations build, manage and orchestrate any cloud environment from a single software stack by making the management and automation of any cloud, virtualized environment, infrastructure and application stack as fast, scalable and easy as possible. SaltStack Enterprise support for Google Compute Engine is now available, the combination of which is noted for speed, scale and reliability. SaltStack provides flexible, easy-to-use software for real-time infrastructure automation and application stack configuration management, private cloud building, public cloud orchestration, and autonomic infrastructure. SaltStack is known for its speed and its ability to scale unmodified to support environments with tens of thousands of systems with no performance or functional degradation. 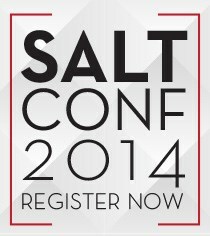 Join SaltStack customers, users, developers, core engineers, and partners at SaltConf, the annual SaltStack user conference, from Jan. 28-30, 2014 in Salt Lake City. SaltConf will sell out. Registration deadline is Friday, Jan. 3, 2014. More details can be found at http://www.saltconf.com.